I found myself once again at the Boston Public Market - this time in search of something special for dinner. I was attracted to a showcase of vibrantly colored, whimsically shaped fresh pastas at the Nella Pasta display. Greeted by smiling faces behind the counter, I left with an array of assorted fresh pastas to taste test and share. Leigh Foster and Rachel Marshall created Nella Pasta after realizing the both shared a passion for pasta making. With backgrounds in cooking and experience living abroad in Florence, they set off on creating a business featuring an array of fun raviolis, and fresh and dried pastas. The best part of Nella (‘in it’ in Italian) is its ingredients - all are super seasonal, local and fresh. Minimal preparation is necessary as the pasta’s flavors are so pronounced and ready to jump off your palette. I was instantly intrigued by the Orange Zest Creste de Gallo which has lovely hints of orange resonating through the adorable half moons. 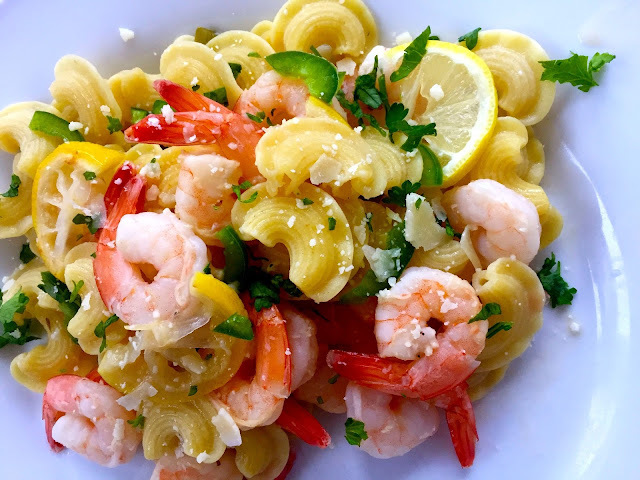 Since I almost always pair citrus and seafood, I added shrimp to the pasta along with thinly sliced lemon halves, jalapeno for spice, and a garlicky, butter sauce. With fresh grated Parmigiano Reggiano on top, the dish added a pop of zest to a wintery winter evening. In a large skillet heat 1 T EVOO over medium-high. Add the lemon slices and season with a pinch of salt. Cook until the lemons are browned a bit at the edges, about 3 minutes. Transfer to a plate. Add 2 T EVOO and 2 T butter to the same skillet. Add the garlic, salt and pepper and saute for 1 minute. Add the shrimp and jalapeños and saute for about 3 minutes more or until the shrimp become opaque. Stir in the lemon juice, extra 1 T butter and reduce heat to medium. Add the pasta to the large pot of boiling salted water and cook for 2 minutes. When al dente, remove the pasta with a slotted spoon and add it directly to the saute pan. Add the reserved lemon slices, fresh chopped parsley and toss for 1 more minute. Serve with a drizzle of EVOO and grated Parmigiano Reggiano. Serves 4 - 5. I gave a couple boxes of the Garlic Parsley pasta to Kara and am so excited to see what she has in store!